So what does it take to make famous collections - Famous? After-all, it's not that difficult to find a fashionable design or a gemstone ring with a perfect certificate. Great collections in the History of Jewelry share one common denominator. The collections are personal and deeply stirring. Consider ex-President, Hosni Mubarak Egyptian Gift Collection. The collection is deeply personal but will go down in history as being "famous" for all the wrong reasons. The great Antique Jewelry and Pearl Collectors, such as the famous Hollywood actress Elizabeth Taylor carefully avoided the ordinary, selecting Antique Jewelry, 20th Century Jewelry and Pearls of extraordinary beauty, and of historical importance. The Peregrina Pearl acquired by Elizabeth Taylor is a perfect example of a famous pearl. Natural Pearls were the Maharajahs ultimate Passion. The Maharajah of Baroda's court tunic was spun from gold in India, with only one family in his state allowed to weave its threads. Among his most precious treasures were the famous collections of tapestries made entirely of Natural Pearls into which were woven ornate designs of rubies and emerald gemstones. Jaipur's maharajah lorded over one of the largest and richest of India's princely states. Somewhere in the Jaigarh fort, on a peak above the palace, the treasure of Indian jewels of the Jaipur princes lay buried, guarded by an especially belligerent Rajput tribe, the Minas. Once per lifetime, each maharajah was allowed to visit the treasure and select a single item. Man Singh chose from the private treasure a bird of solid gold studded with rubies of extraordinary fire, so heavy that a woman could hardly lift it. In stark contrast to the first Imperial Easter Egg by Carl Faberge, a tiny golden hen with ruby eyes that sat inside a small white enamelled egg. Independence came before the last maharajah, India’s most dashing prince, Man Singh II, (Jai Singh) the polo-playing Maharaja of Jaipur, known to everyone as “Jai” had time to choose. However, Jai Singh didn't do too badly. One of the most famous collections in the world, the rocks of this Raj included a triple-stringed necklace of incredible red spinel gemstones. These red spinels had been contributed by various Mughal emperors, and were each bigger than a pigeon's egg, along with three huge green emerald gemstones, the largest of which weighed 490 Cts! It was inevitable that, with independence in 1947 and the rise of the socialist Congress party, the world of extravagant excess should come to an end. Even India’s princes, who had negotiated with Mountbatten to keep their titles and income, were shocked at the speed of their loss of privileges. Mrs Gandhi declared war on them when she was prime minister, eventually stripping them of their state revenues in the 1970s. Even so, he didn't come off too badly. Among the world's greatest polo players, Jai Singh died in an appropriate form, atop his polo pony, one of the three richest men in England. One of the most famous collections of gemstones and jewellery was acquired by the Indian government in 1995. These magnificent jewels once belonged to the Indian princes: the Narcissistic Nizams' of Hyderabad. Presiding over one of the largest states (half the size of France), their dominion included Golconda. In former times, Golconda was the world's diamond centre. The ornaments date from the early 18th century to the early 20th century. Finely crafted from gold and silver and highlighted with exquisite enamelling, the jewels are set with Colombian emerald gemstones, diamonds from Golconda mines, Burmese rubies and spinels and pearls from Basra and India. Though only a fraction of the legendary wealth of Asaf Jah dynasty, the collection is breathtaking when translated into gem weight. There are 25,000 diamonds weighing in excess of 12,000 carats. 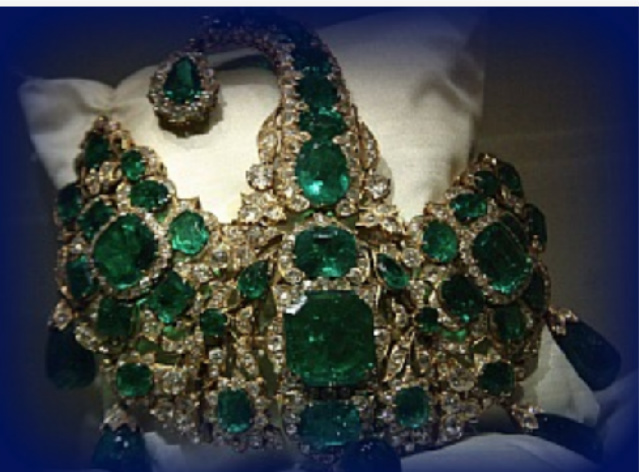 More than 2,000 emeralds were weighing over 10,000 carats and pearls exceeding 40,000 chows. Not only did the Nizams love gemstones they also coveted titles. Among the titles of the seventh Nizam, Sir Osman Ali Khan Bahadur, were included: "Regulator of the Country, Victorious in Battle, the Aristotle of his Age, Shadow of God and Faithful Ally of the British." While Osman Ali may not have been the world's richest man, he certainly qualified as the world's greatest miser. His wealth included two lime-sized diamonds of over 180 cts each; among the diamond collection were the Nizam Diamond and the Jacob Diamond (100 cts) but in keeping with his frugal nature, one was used as a paperweight. Amongst the Nizam's famous collections was a pearl collection, said to be so vast that it alone would cover the sidewalks of Piccadilly Circus, plus he owned over seventy million dollars in gold. But incredible as it sounds, despite his vast assets and famous collections of jewels, visitors to the palace would be presented with only one cup of tea, one biscuit, and one cigarette! After his victims left, Nizam Ali would drink any remaining tea, eat the crumbs left over from the biscuits and smoke the cigarette butts to the end. Over ten million dollars in cash was stashed in his basement, earning negative interest, as rats gnawed their way through thousands each year. Unani medicine promoted good health through ingesting powdered gemstones. Being a believer in the Unani medical system that has it roots in Ancient Greece, Hyderabad became the only place in the world with free clinics and a hospital devoted to Unani medicine. According to India Astronomy, each gemstone should be carefully chosen precisely to match the qualities of the person as each gemstone has special meanings. "Indians are very superstitious about gems," explains Munnu Kasliwal. "If anyone buys a stolen stone or acquires it wrongly, it will curse them. We have a saying, ‘Someone who steals gems will lose their eyesight.’"
No Maharajah followed the Unani medical system better than one of the early Maharajahs of Mysore. Informed that the finest aphrodisiacs contained crushed diamonds, he succeeded in quickly depleting the famous collections held in the state treasury in his princely quest for potency. 1. This account of the maharajahs is based largely on 1. Lord (1971), Collins & Lapierre (1975) and Allen & Dwivedi (1984) and 2. Bala Krishna, Ush R., The Jewels of the Nizams, India Book House, Suffolk, 2001. 2. Munni Kasliwal of Gem Palace in Made for Maharajas, by Amin Jaffer, 2006, New Holland.